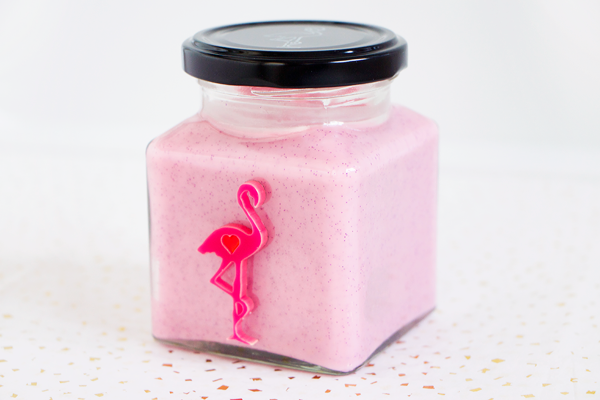 For Valentine's Day 2014 Flamingo Candles brought out their incredible Love Potion candle. I honestly didn't think they would be able to top it's delicious sugary sweet scent but boy have they proved me wrong! Love Bug is this year's Valentine candle and it's fragrance is on a whole 'nother level. Apparently Love Bug combines blends of mandarin & petitgrain with subtle undertones of cinnamon. I found this description quite strange because I was sent a very festive Arran Aromatics mandarin & petitgrain candle at Christmas & these two candles couldn't smell any more different. Love Bug is certainly fruity but sugar is the pervasive note here. To me it smells like a cross between strawberry sherbet and rhubarb & custards. It's even sicklier than Love Potion was & I'm absolutely loving it! Love Potion reminded me of being in a sweet shop whereas Love Bug is more like stuffing your face with a huge bag of pick 'n' mix. The fragrance is so much more powerful & gives you an intense hit of sugar without the excess calories. This candle doesn't just smell amazing but it looks really beautiful too. 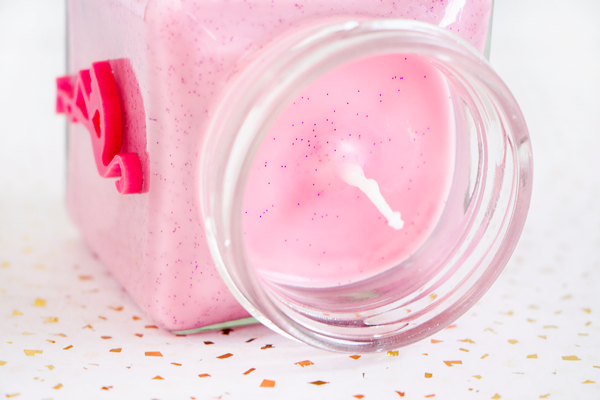 I'm completely obsessed with Flamingo Candles' unique square jar packaging. My whole mantlepiece is full of them now! 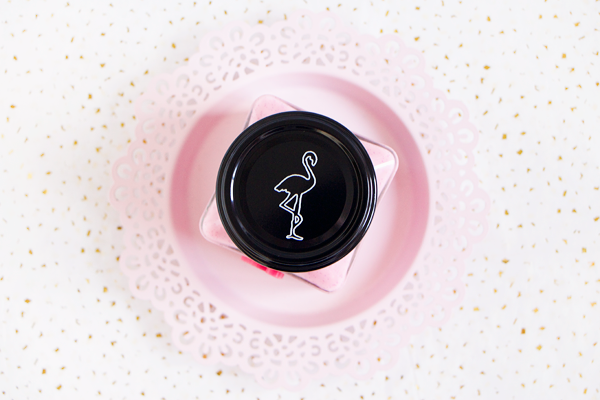 The combination of the candy coloured waxes & their signature acrylic Florrie flamingos is just way too cute. Love Bug looks even more special because they've added purple glitter to the baby pink candle wax. When the wax begins to melt it changes into a hot pink shade & the glitter floating within simply looks stunning. Love Bug was made using hand-poured EcoSoya soy wax and features a natural cotton wick resulting in a cleaner, longer & non-toxic burn. Each of these classic square jar candles offers up to 50 hours of burn time so they're such excellent value for money. Love Bug is a real sweet treat & would be a sure-fire winner with the one you love. Valentine's Day is the perfect excuse to fill your home with all things pink & sparkly and it'd make a wonderful gift for anyone regardless of their relationship status. It's nice to find something that isn't your typical floral scent at this time of year. If you burn this candle on Valentine's Day then love will most definitely be in the air! I so need to try this brand, I keep putting it off but I think I'm the only person in the world that hasn't tried it! Love the look of this! I adore Flamingo candles, I totally agree, not only do they smell great they are just so pretty!